this delicious take on a great wrap! Wrap your mouth around our most mouth-watering wrap and you'll get a mouthful of flavor! Wow! Did we just really say that? I guess we did! Seriously, this tempeh and apple wrap is delicious and combines a myriad of flavors from the nutty tempeh to the sweet apple to the dressing with a bite. You'll make this one again! Place the tempeh cubes in a small saucepan with a steam basket and steam-cook for about 10 minutes. Sprinkle first with the smoked paprika. Meanwhile, chop the onion and shred the carrots and place them in a large bowl. Add the apple, pumpkin seeds and spinach and toss to mix. When the tempeh has cooked, allow it to cool to at least room temp. As it is cooling mix the vegenaise, chili powder, ground cumin and red pepper flakes thoroughly. Add the dressing to the bowl with the spinach mixture and toss to coat. When the tempeh has cooled add it to the bowl with the spinach mixture and toss again to incorporate the tempeh. Lay four multi-grain tortillas on a cutting board. Spoon the mixture across one edge of the tortilla, to almost the middle. 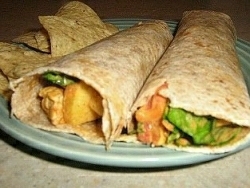 Fold and tuck the tortilla to form a delicious wrap. Repeat with the other three tortillas.